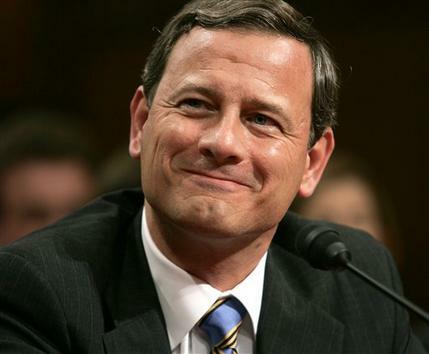 Last month United States Supreme Court Chief Justice John Roberts delivered the commencement address at Cardigan Mountain School, a private all-boys school in New Hampshire, where his son was graduating from the ninth grade. In the following excerpt, Roberts wishes the boys the bad luck and troubles needed to build character and teach compassion. Commencement speakers will typically wish you good luck and extend good wishes to you. I will not do that, and I’ll tell you why. From time to time in the years to come, I hope you will be treated unfairly– so that you will come to know the value of justice. I hope that you will suffer betrayal– because that will teach you the importance of loyalty. Sorry to say, but I hope you will be lonely from time to time– so that you don’t take friends for granted. I wish you bad luck, again, from time to time– so that you will be conscious of the role of chance in life, and understand that your success is not completely deserved, and that the failure of others is not completely deserved either. And when you lose, as you will from time to time, I hope every now and then your opponent will gloat over your failure. It is a way for you to understand the importance of sportsmanship. I hope you’ll be ignored– so you’ll know the importance of listening to others. Whether I wish these things or not, they’re going to happen. Whether you benefit from them or not will depend upon your ability to see the message in your misfortunes. Commencement speakers are also expected to give some advice. They give grand advice, and they give some useful tips. The most common grand advice they give is for you to “be yourself.” …You should be yourself, but you should understand what that means. Unless you are perfect, it does not mean don’t make any changes. In a certain sense, you should not be yourself. You should try to become something better. People say ‘be yourself” because they want youth resist the impulse to conform to what others want you to be. But you can’t be yourself if you don’t learn who you are, and you can’t learn who you are unless you think about it. The Greek philosopher Socrates said, “The unexamined life is it not worth living.” And while “just do it” might be a good motto for some things, it’s not a good motto when trying to figure out how to live your life that is before you… The best way to lose the values that are central to who you are is to not think about them at all. When you get to your new school, walk up and introduce yourself to the person who is raking the leaves, shoveling the snow, or emptying the trash. Learn their name and call them by their name during your time at the school. Another piece of advice: When you pass by people you don’t recognize on the walks, smile, look them in the eye, and say hello. The worst thing that will happen is that you will become known as the young man who smiles and says hello. Romans 5:3b-4 — We know that suffering produces perseverance; perseverance, character; and character, hope. James 1:2-4 — Consider it pure joy, my brothers and sisters, whenever you face trials of many kinds, because you know that the testing of your faith produces perseverance. Let perseverance finish its work so that you may be mature and complete, not lacking anything. II Corinthians 12:7b-10 — In order to keep me from becoming conceited, I was given a thorn in my flesh, a messenger of Satan, to torment me. Three times I pleaded with the Lord to take it away from me. But he said to me, “My grace is sufficient for you, for my power is made perfect in weakness.” Therefore I will boast all the more gladly about my weaknesses, so that Christ’s power may rest on me. That is why, for Christ’s sake, I delight in weaknesses, in insults, in hardships, in persecutions, in difficulties. For when I am weak, then I am strong. My wife and I did not intend to have another year of sweeping changes in 2016. We never do. We told ourselves this year was going to be different. The roller coaster was finally going to stop. No more big transitions like the previous eight years of marriage. We had already been through the stress of getting married, buying a home in D.C., me getting diagnosed with a disruptive chronic illness, having a baby, having another baby 19 months later, a significant divorce in the family, selling our home in D.C., moving to North Carolina for a new job, moving back to D.C. for another job, and buying another home in D.C.
Raquel and I wanted a nice, calm 2016 — one that was exciting, but in a good, non-stressful way. It was not meant to be. Before 2016 was over, we began attending a new church after being at the previous one for a decade; we had a new baby who was in pain for his first six weeks; I got a new job; we dealt with a significant conflict; and I had some bizarre developments with my illness. All this and more sucked up a ton of our emotional energy, and now three months into 2017, we’re still worn out from last year. Last night, Raquel and I were talking about the constant bumps during our first nine years of marriage, and we wondered out loud why this seems to happen to us every year. “It would be nice to have an easy year like some of our friends did last year,” Raquel said. We couldn’t think of anyone. Some of the many stressful examples in our friends’ lives included cancer, having new babies, starting a church, dealing with persistent and chronic illnesses, poverty, serious marital problems, emotional breakdowns, publishing and promoting a book, buying and selling a home, caring for an elderly mom with dementia, having a falling out with siblings, getting fired, and having a toddler who went for weeks barely sleeping. Our friends, like us, have often felt spiritually dry and emotionally low during these times. And a lot of it has to do with the sense that we’re doing something wrong, that the dullness in our souls is a result of our distance from God. Fears like this take hard circumstances and convert them into hopelessness, and I think that’s exactly what the Enemy of our souls wants. In The Screwtape Letters, C.S. Lewis tells the story of two demons playing with a man’s mind and diverting him away from experiencing God’s love. One tactic the demons employ is keeping the man from realizing that emotional peaks and valleys are a natural part of life. In these times, I have to remind myself that God is not absent, and He can still work in me and through me. The path through the valley is not an infinite one. It eventually leads to another mountaintop or at least a plateau. Relief often comes when I least expect it, but in the meantime, I often feel drained and have little to give. That’s where I’ve been for the last few days and especially last night. I drove home tired and disappointed in myself. I was overwhelmed at work, I felt disconnected from my church and friends, and I couldn’t find my phone. As soon as I opened the door, my five- and seven-year-old daughters came running up wearing their pajamas inside out and asked me to play with them. They wouldn’t drop it, and for the next hour they kept asking me to change my clothes. Their persistence finally won out, and to their delight, I took off my suit and put on inside out pajamas. I ate dinner with them, put my giggling baby boy in his crib, and watched them laughing as they passed gas for fun — and I slowly started feeling a little lighter. Mark 15:34 — At three in the afternoon Jesus cried out in a loud voice, “Eloi, Eloi, lema sabachthani?” (which means “My God, my God, why have you forsaken me?”). Ah Lord, my prayers are dead, my affections dead, and my heart is dead: but you are a living, loving God and I commit myself to you. Amen. By William Willimon, Pulpit Resource, January 31,1999, p. 19. When I first visited him, he was a successful businessman, with a fine home, a beautiful family, and three cars in the custom-built garage. The last time I saw him, after the trial, he was peering at me through the bars of a state prison and he looked like a scared, helpless, little boy. It is something to see someone who has been something reduced to nothing. Something sad. Yet, when those who seemed to be something are reduced to nothing, it becomes possible for their lives to be reconstituted into a new something, some new reality outside of themselves and their devising. Those who once sustained their lives on their own, by their accumulation of success, power, prestige, and glory, in their foolish nothingness, are now free to see a reality greater than themselves, namely, the wisdom of God, in Christ, which is now the word of the cross. On the cross, Jesus committed his Spirit into the hands of his Father. When you have been stripped, beaten down, and picked clean, there is nowhere else to go. And after the experience of the cross in our life pulls open, stirs up, demolishes our wisdom and power, we are free to encounter a different reality. I pulled up a chair close to her bed. She was in great pain, flung down by a serious illness that had kept her in the hospital for weeks. What greater motive could there be to a religious life than the vanity and the poorness of all worldly enjoyments? What greater call could there be to look toward God than the pains, the sickness, the crosses, and the vexations of this life? What miracles could more strongly appeal to our senses, or what message from heaven speak louder to us than the daily dying and departure of our fellow creatures? The one thing needful and the great end of life need not be discovered by fine reasoning and deep reflections. It is pressed upon us in the plainest manner by the experience of all our senses, by everything that we meet with in life. –William Law (1686-1761), A Serious Call to a Devout and Holy Life. 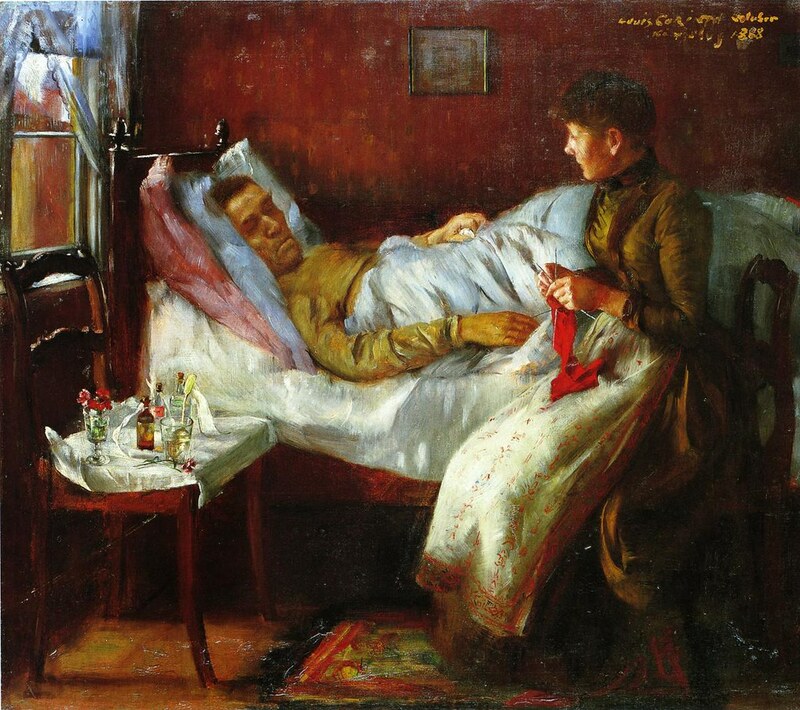 Sickness is the everyday, in-life experience of vulnerability, finitude, and death. Sickness, at its worse, is a foretaste of what it is like to have the world go on without you, to be nothing. Sickness is a reminder that life is fragile, limited, vulnerable– in short, terminal. Sickness is a brush with death. Roman Catholic writer Flannery O’Connor died in 1964 at the age of 39 after a twelve year battle with lupus. She once wrote in a letter: “I have never been anywhere but sick. In a sense, sickness is a place, more instructive than a long trip to Europe, and it’s always a place where there’s no company, where nobody can follow. Sickness before death is a very appropriate thing, and I think those who don’t have it miss one of God’s mercies.” —Habit of Being, page 163. I Corinthians 1:18 — For the message of the cross is foolishness to those who are perishing, but to us who are being saved it is the power of God. I Corinthians 1:27-29 — But God chose the foolish things of the world to shame the wise; God chose the weak things of the world to shame the strong. God chose the lowly things of this world and the despised things—and the things that are not—to nullify the things that are, so that no one may boast before him. Snakes, or serpents (as they are called in the older translations), appear 53 times in the Bible. The best known appearance of a serpent is in the story of the temptation of Adam and Eve, and there the serpent is purely evil. But that is not always the case. God, speaking out of the burning bush, convinces Moses of his power by turning his shepherd’s staff into a snake, and then back again. Later, in his appearance before Pharaoh, the Egyptian magicians do the same trick, making snakes appear out of nowhere. But then Moses’ snake devours the magician’s snakes, thus making that snake a positive symbol of God’s power. In this story, the image is a mixture of positive and negative. The snakes are killing the people, and that’s bad; but then, the people are saved by looking to an image of a snake, and that’s good. The snake is a powerful image, because snakes are so despised by people. They are probably the most despised of all God‘s creatures. And that makes this positive use of a snake a deep and dark and yet profound image of salvation. Somehow, in the hands of God, evil and good, threat and promise, life and death, can sometimes be all mixed together. What we fear most, may sometimes be the source of a great blessing. God can make it so. Serious illness, always unpleasant and never on anyone’s wish list, has often prompted people to return to God. Financial difficulties probably lead to more prayer than does abounding wealth. And death, that most fearsome of all things, becomes in God’s hands merely the doorway into eternal life. God’s way is to take what is bad and use it to work toward an even greater good. The greatest example of that is what happened on that day we now call Good Friday. No one who loved Jesus would have called the Friday afternoon that Jesus was tortured and then crucified a good day. But the Easter resurrection and the promise of Jesus that by his death on that cross all our sins are forgiven, made good come out of what happened on that most evil of all days. It is often the case that what the Old Testament hints at, the New Testament fulfills in an even greater way. In Numbers 21 the people are saved by looking up to a snake. They are saved, but in rather unappealing way. In the New Testament, we learn that we are saved by looking up to a cross, in another unpleasant story. But we look not primarily to the cross but to the man on the cross, Jesus, who told us himself that we will never find a better friend than what we have in him. “Greater love hath no man than this, that he lay down his life for his friends,” said Jesus, “and if you believe in me, you are my friends.” We would be lost without Jesus, but with Jesus we are quite safe, now and forever. John 3:14-15 — Just as Moses lifted up the snake in the wilderness, so the Son of Man must be lifted up, that everyone who believes may have eternal life in him. Blessed Lord Jesus, who knows the depths of loneliness and the dark hours of the absence of human sympathy and friendliness: help me to pass the weary hours of the night and the heavy hours of the day, as you did, and know that you are with me, as your Father was with you; lift up my heart to full communion with you; strengthen me for my duty; keep me constant to my trust, and let me know that however dark or desolate the hour, I am not alone, for you are with me; your rod and your staff are my comfort; through Jesus Christ our Lord, who lives and reigns with the Father and the Holy Spirit, ever one God, world without end. Amen. Shown above is the logo of the American Medical Association. It is a snake, wrapped around a pole. Of all the things doctors do and work with, why would the AMA pick a snake as the logo for their association? People don’t like snakes. And what do snakes have to do with doctors, anyway? When you think of doctors you might think of a stethoscope, or a thermometer, or a scalpel, or a bottle of pills, or a white jacket, or a needle for giving shots. There a hundred other things you would think of when you think of doctors and medical care before you would think of a snake. I went to the AMA website for an explanation of their logo. It says there that the design comes from an ancient Greek symbol of medicine, which is the staff of Aesculapius. According to Greek mythology, Aesculapius was the son of the sun god Apollo and was gifted in the healing arts; and, he had learned a thing or two from watching one snake bring a dead snake back to life with some magical herbs. This finally got everyone’s attention and they realized how ungrateful they had been. They cried out to Moses, admitted their sin, and asked Moses to pray to God to forgive them and rid them of all those deadly snakes. So, says verse seven, Moses prayed for the people. And God answered the prayer– but NOT by taking the snakes away. God allowed the snakes to remain in the camp, and allowed them to continue biting the people with their deadly poison. God did, however, provide for a cure, as described in verses eight and nine: “The Lord said to Moses, ‘Make a snake and put it up on a pole; anyone who is bitten can look at it and live.’ Then when anyone was bitten by a snake and looked up at the bronze snake, he lived.” It was by obeying God and looking to a snake on a pole that they were healed. I think that would be a better story for the American Medical Association’s logo. What a strange and powerful story this is! Think about it. The snakes remained in the camp, the camp where people lived and slept in tents. God allowed the snakes to remain and do their slithering around and biting everyone. What God did provide was a cure, a solution to the problem, and a chance to stay alive. But God did not take away the snakes. This is an accurate illustration of what life is really like. When has God ever, in response to anyone’s prayer, taken away all their troubles? Never. That never happens. God heals, God delivers, God protects, God gives strength, God gives solutions and assistance in all sorts of ways– but never does God take ALL of the troubles away. Some of the irritations, the troubles, the heartache, the worry, the sadness, the stress, or whatever it is for you, remains. The ‘snakes’ remain in one form or another. And, just like in Numbers 21, as we continue to get bit by our troubles, we must continue to look up to God. If, in our present state of sin, God would ever bless us with a perfect life, the first thing we would do is forget all about God. That is the story of the Old Testament in a nutshell– the better things would go for the people, the more apt they would be to forget all about God. That’s the nature of human ingratitude. Psalm 119:67 — Before I was afflicted I went astray: But now I have kept thy word. II Corinthians 4;17 — For our light affliction, which is but for a moment, worketh for us a far more exceeding and eternal weight of glory. Psalm 113:13-14 — As a father has compassion on his children, so the Lord has compassion on those who fear him; for he knows how we are formed, he remembers that we are dust.